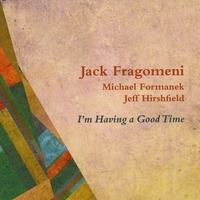 A long-overdue trio recording by legendary upstate NY jazz guitarist Jack Fragomeni (1951-2009), featuring Michael Formanek and Jeff Hirshfield. Jack Fragomeni (1951-2009) was a renowned jazz guitarist and teacher based in upstate New York, who for many years performed throughout the area and appeared with numerous jazz greats, including Nick Brignola, Bucky Pizzarelli, Eddie Daniels, and many others. Bassist Michael Formanek has performed with Freddie Hubbard, Stan Getz, Chet Baker, Tony Williams, Gerry Mulligan, Joe Henderson, Attila Zoller, and Joe Lovano. Drummer Jeff Hirshfield has performed with Jim Hall, Toots Thielemans, Paul Bley, Bob Brookmeyer, and Greg Osby. Their musical rapport with Jack was masterful, and integral to the musical success of the trio recording. I’m Having a Good Time is an excellent introduction and testament to Jack Fragomeni as a great jazz guitarist and composer. Jack was a long-time friend and a terrific musician (as well as an expert fly fisherman), who should have been more widely known. My involvement in releasing this project was truly a labor of love. 'Great stuff!